Since 2001, the web journal published by Ankerson and Sapnar, Poems that Go, has gathered an impressive archive of digital poetry. Cruising is an excellent example of a Flash poem that, while primarily linear and cinematic, makes use of interactivity in a limited way that complements the subject of the poem, the coming-of-age ritual cruising, with hormones raging, in small town America. Author description: On one level, Cruising is an excited oral recitation of a teenager's favorite pastime in small town Wisconsin, racing up and down the main drag of Main Street looking to make connections, wanting love. But by merging the linear aspect of the sound recording with an interactive component that demands a degree of control, Cruising reinforces the spatial and temporal themes of the poem by requiring the user to learn how to “drive” the text. A new user must first struggle with gaining control of the speed, the direction, and the scale in order to follow the textual path of the narrative. 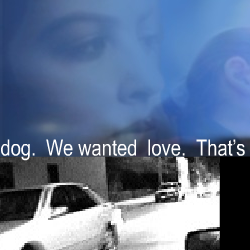 When the text on the screen and the spoken words are made to coincide, the rush of the image sequence is reduced to a slow ongoing loop of still frames. The viewer moves between reading text and experiencing a filmic flow of images — but cannot exactly have both at the same time. In this way, the work seeks to highlight the materiality of text, film, and interface. Instructions: To hear the sound, turn on the computer's speakers or plug in headphones. Move the cursor up and down to control the size of the piece, left and right to control the scrolling speed of the text and images. Previous publication: Cruising was published in April 2001 on Poems that Go, http://www.poemsthatgo.com.